Such proportion would not possibly affect psychological or visual inconveniences, although it apparently impresses the feeling that is exceptional or looks extraordinary. It is inevitable that the depth of space that would become larger since the motifs are located remarkably at the small area, compared with the whole picture. Interpreting space which is unnecessarily expanded thus provides visual concentration and a feeling of stability. Above all, it lessens burden of the sight due to grow the distance relatively. In case the visual range has become grown, it might create a question because the viewer cannot go near to the aesthetic value of motifs. However, as previously description, the beauty of formative interpretation created by overlapping motifs needs to be less observed than each physical beautifulness. Creating the picture during the artwork, i.e. a formative form, is not exactly meant to describe an image. It is also a matter of formating that the way of how to arrange motifs, construction, and composition. 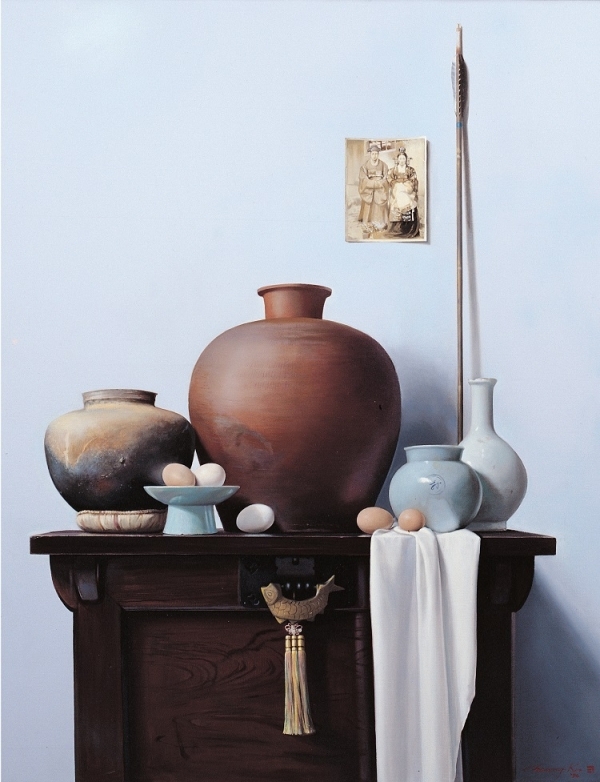 Therefore, Koo’s method to establish the motifs can be recognized another interpretation for his formative works. Furthermore, the way of organising space is become a part of formative works. The meaning of space is varied compared with the size of motifs and its proportion against the picture, because a motif can exist within the space. Interpretation of space pursued by Koo(ARTIST KOO CHA SOONG,具滋勝,서양화가 구자승,구자승 작가,구자승 화백,KOO CHA SOONG)is apparently based on the notion of the marginal blank in the field of oriental paintings; it symbolises an open space. Its idea is fundamentally different from the general view of “an empty space” in the western art works.